Ever notice how often some people change their profile photo on facebook? Jane only had one profile photo. Thankfully, her sister, Cassandra, had Jane pose for a portrait. It was drawn in 1810; Jane was 35 at the time. One has to wonder what Jane actually looked like. Both she and Cassandra loved books, music, and drawing which leads me to believe that Cassandra was able to capture at least some likeness of Jane in her drawing. I read today in the paper that a new drawing of Jane has been discovered in the UK. 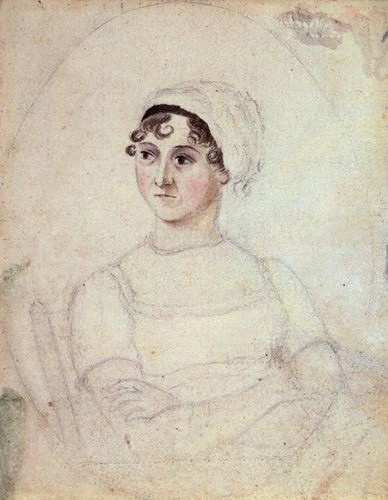 The owners of the drawing and an auctioneer believe that it is Jane Austen, but it has not been confirmed. And it very well may be, but I’m skeptical, as I always am. All I know is that this drawing (primitive as it may be) is how Cassandra saw Jane and I trust Cassandra. Her loving sister knew her better than anyone and they both seemed satisfied enough to hold on to the drawing through the years. That’s good enough for me. This is Jane. Thank you Cassandra. What a thought! I love this post! Actually, it makes me start wondering…what if Jane had an FB account. What would her avatars look like? Would Jane do one of the ubiquitous: “Jane looking cool in her oversized sunglasses” pose? Or would we see her looking at the camera with an almost smile and a hint of laughter in her eye? I suppose in a way you are right. For Jane, one picture works because I think her writings give my mind’s eye many pictures of her. But still, would love see a spontaneous pic of Jane at girl’s afternoon with her BFFs. Christie, Thanks for taking the time to read! You are so right on your observations!